Category Archives for "Electric Range Reviews"
There are also a variety of designs available and types to suit everyone’s home; especially those who want to maintain a nice and elegant look where cabinetry and counter matches. One type of range is the slide-in range where it is placed in between cabinets or counters. The top of which is slightly protruded so it gives the appearance of it resting atop the counters, making it look like it was built-in there. Many owners like this effect, as the range doesn’t look foreign in the kitchen. There are many brands of slide-in ranges. To give you an idea of what’s available in the market and the price point, we have listed three ranges worth checking out. What are the advantages of a slide-in range? 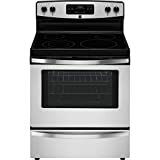 This gas range can be connected easily to your existing gas line but you might need help in installation if you haven’t done it before or you were a previous electric range owner. It comes in three colors: Black, White, and Stainless Steel. If you aren’t going for a theme, it is recommended to pick the stainless steel one because it looks more elegant and it can fit nicely with your other appliances. It also pairs up well with any tile colors, stones, or woods. It is measured 30 inches, a bit bigger than the standard, but it can slide in nicely in between cabinetry or counters. No installation is really required, as you just have to push it up where it will belong. Take not that you have to measure your available space against this range to be sure that you have enough to fit it in snuggly. 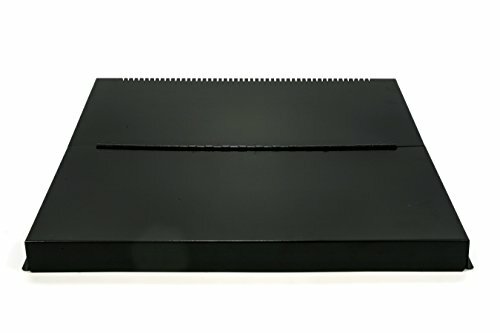 It comes with four burners that have respective 5,000 BTUs, 9,500 BTUs, 12,000 BTUs, and 17,000 BTUs. The built-in oven has baking of 18,000 BTUs and broiling at 11,500 BTUs. It has pre-set options for warming, heating, quick baking, etc. at the touch of a button. The oven also comes with quick preheat that does its job in only a matter of minutes, meaning you don’t have to wait too long to put your goodies into the oven. It also has the ability to self-clean. This range is a really nice addition to your kitchen because of its elegant-looking minimalistic design. The top is also slightly raised so the sides would sit snuggly on the counters or cabinetry next to it, giving it the appearance of being built-in, instead of pushed in. It measures 30 inches, slightly bigger than the average size of ranges. It comes with a smooth top cover that protects the burners when not in use. It also gives a clean and neat appearance. This is an electric range that doesn’t have any provision for gas connection. The cooking surface is very smooth and has five slots for your pots and pans for multiple cooking at the same time. The control pad contains flat surface built-in buttons that definitely looks elegant as well as a digital timer for baking. The dual ovens easily heat up using a quick preheat feature and it has a total cooking space of 6.6 cubic foot. The convection oven is self-cleaning so you won’t have to waste time scrubbing. 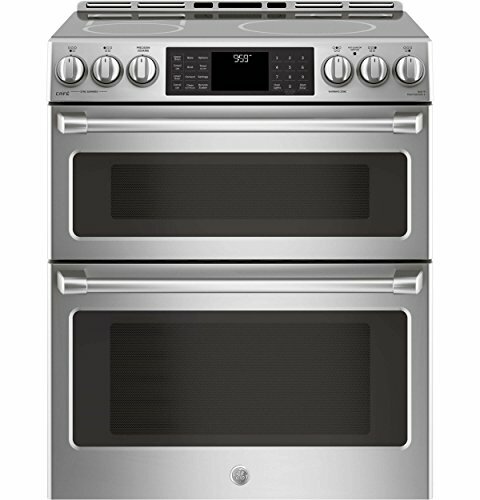 The only con for this GE electric range is that it is priced higher than most electric ranges. You will be able to purchase a good double oven one without breaking off the 2,000-dollar mark. The good thing is, if you have the money to spend, this is worth every penny. This electric oven comes with five cooking slots for your pots and pans and has one built-in oven with a total of 5.8 cubic foot capacity. To compete with ranges with double ovens, Samsung designed a Flex Duo Technology that gives you the capacity of a single oven with the efficiency and flexibility of two ovens. The extra large oven can cater to big roasts, multiple casserole dishes, or several cookie racks. It also comes with three oven racks to separate your dishes and give more space. The bottom tier is a pullout drawer that serves as a warming area for your dishes. After cooking, place it in the warming drawer to keep the temperature until dinner is ready. The ovens and the burners also heat up fast so waiting time is lessened. The only con for this product is the design of the knobs. 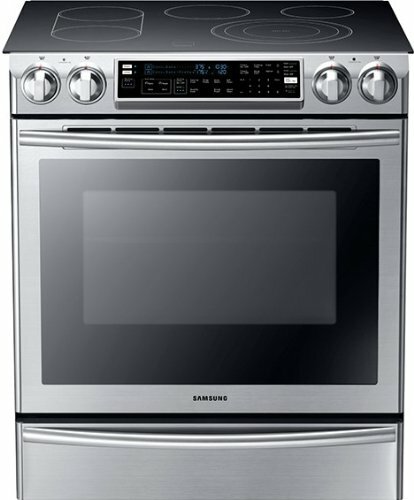 Unlike the GE Electric range reviewed above, the knobs and switches of the Samsung range is protruded so it’s more prone to accidental hits. It allows you to have a seamless design in your kitchen. It is designed to have a wider top to overlap onto the counter, giving it a built-in look. It has dimensions that can easily fit onto cabinets so you don’t have to really customize your cabinetry. It enhances cleanability as there will be no food or morsels that can drop down to the sides. It is great for kitchen designs with a custom backsplash. There are a variety of slide-in ranges you can choose from depending on your taste and budget. You can pick if you want a gas or an electric model and pick how many burners and ovens you want built into the range. While slide-in ranges are more expensive that freestanding ones, many customers opt for the slide-in models because it not only works as a great range but it also integrates seamlessly into the kitchen, which is really nice and elegant to look at. Some people may not be entirely sure what a Slide-in Electric Range is, as the name omits a certain detail that makes it easy to distinguish. Essentially a Range is the shortened name for a cooking range, a device that contains many tools utilized in the kitchen, such as multiple stovetops, oven and sometimes may even have a smoker. The convenience of a having a cooking range makes the use of the kitchen simpler and easier to access, which can also be improved by having one that is electric and slides in. Slide-In Electric Ranges help to provide a less difficult time managing the fuel source and the slide-in functionality makes it easier to set up and faster to get working, as well as making it more viable for repair should anything go wrong. However, there are certain features to each design. This slide-in oven would definitely look great and add glam to your kitchen. Not only is it made from high quality stainless steel finish that doesn’t wear over time, it also has a widened top that is designed to rest on both sides of the kitchen cabinetry, giving it a look of being built-in. It has a timeless appeal that would suit the tastes of minimalists because of its no-nonsense design and structure. The cooktop is smooth and shiny, made of glass that is perfect for varying heat. It contains five heating elements in different sizes, but can suit most shapes and sizes of pots and pans because each heating element may be adjusted accordingly. It has double ovens with a total cooking capacity of 6.6 cu ft., perfect for baking dishes large or small. Because each oven functions independently, you may choose different settings and temperature for each, making it perfect if you are baking a lot of dishes at the same time. The top oven is a bit slimmer than the bottom, perfect for baking pizza and bread, while the wider bottom is perfect for whole turkey and racks of ribs. The control panel has a digital face so you can effectively see the timer and the buttons are smooth and built-in a pad. Range doesn’t come with a backsplash so you need to have something installed behind it so that no food morsels would fall behind it. This is definitely a deal-breaker and it shouldn’t stop you from getting the range just because of this. Also, this range has very sensitive buttons situated in front. If you have curious kids, it’s better to put the keys on lock all the time. This slide-in range is simple yet elegant. It features a sleek design that is easy to install; no need for remodeling because the standard size lets you simply push it through the wall, in between two counters/cabinets. The glass cooktop overlaps slightly with the top of your kitchen countertop, giving you a customized built-in look. It features five heating elements in varying sizes but can be adjusted according to the size of your pots and pans. 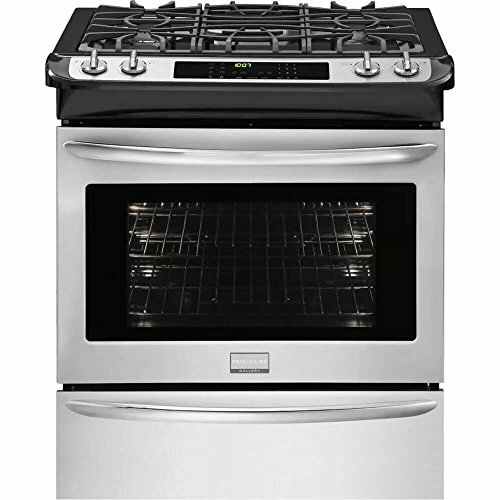 The oven features a wide-angle glass window lets you easily check the progress of your food without having to open the oven door and has a total cooking capacity of 5.8 cu ft. The oven comes in three tiers, separated by metal racks that are all removable to cater to different sizes of your food. You can bake a big roast or multiple casserole dishes. You don’t have to worry about the evenness of temperature on each tier because the true convection system comes with dual fans that allow for faster and more even cooking. At the bottom you will find a storage drawer than can fit your cooking utensils for faster retrieval. You don’t have to worry about the temperature getting into your stuff because it is well insulated and protected. Like the GE range reviewed above, it comes with a digital face that is illuminated so you can see the time and temperature at one glance. The cooktop is made of ceramic surface and must be taken care of. Be careful of dropping heavy pots and pans or it might shatter. This isn’t a big con, as most slide-in electric ranges with smooth top come with ceramic glass. This range is perfect for homeowners who want to have a backup range during cases where the electric supply cuts out, as it can connect to a gas source. It features a lot of the newest technology available for ranges such as the quick pre-heat, true convection, and self-cleaning. It also has several one-touch options that can help you with your cooking; you don’t have to list down settings and temperatures for different types of dishes because it is already found on the keypad. You can keep food warm at a touch of a button or cook pizza and chicken nuggets. The true convection, found in almost all high-end ranges is the newest technology for ovens. It allows users to bake your food evenly, whatever tier it is put on because it adjusts standard baking temperatures to convection temperatures for consistent results. The racks are also flexible, allowing you to cook several dishes at once or cook big roasts. It also features half-racks for smaller casseroles while still giving space for taller dishes. It comes in stainless steel so you don’t have to worry if it will suit the design of your kitchen. The shiny steel will look good no matter where it is put. Some users experienced that the fan of the oven stays on for too long because the oven takes some time to cool down. This is not good especially since the working fan consumes electricity and it is unsafe for people who may accidentally touch the oven, thinking that the cooking is long over. Like the Frigidaire, this electric range has dual fuel so you can easily switch from using gas range to electric when needed. It has a total of four heating elements, perfect for average families. It features the so-called Wave-Touch Controls, which lets you control the panel with mere touches, to display all of the cooking options available, a great feature if you like to be able to cook or heat dishes in a jiffy. It has Perfect Pair Ovens, which features a large main oven and a secondary oven that allows the user to have different cooking options. Through the double ovens and four heating elements, you’re allowed to cook different dishes at once. The bottom oven can cater to smaller food such as pizzs, cookies, and breads while the bigger oven is perfect for large roasts, ribs, and meat. The oven features convection cooking, a system that comes with fans that distribute the heat evenly across the oven. Some customers complained about Electrolux’s poor customer support. It took a while before they had acknowledged that someone needs help and the roster is quite long that many were left waiting with a broken range/problem before someone knocked to their home to help them deal with it. Other than that, this range is great and would last years of use. This range is the perfect addition to your intricately designed cabinetry and series of countertops because it integrates perfectly. The design is simple yet elegant, and it doesn’t require any other customizations in your kitchen for it to fit. Simply slide or push it in between two counters and it would seem like it has been built-in there. This features a touch panel and an illuminated digital screen that lets you see vital information in just one glance. 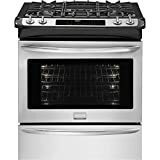 Like all slide-in electric ranges in this price bracket, it comes with a convection system that allows for a more even cooking through the use of their Advanced Circulation System. Their circulation system uses eight vents to optimize the distribution of heated air for even and faster cooking and baking. Cooking time is reduced by up to 25 percent, lessening the time for waiting. The bottom part features a pull out cabinet where you can safely store cooking utensils for faster retrieval. Contains four heating elements and only one is large; the other three is medium to small. 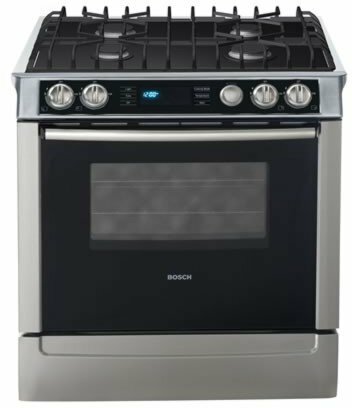 Since the sizes can be adjusted anyway, Bosch should have made at least two large heating elements to cater to different pots and pan sizes. Another con (or pro to some) is the Sabbath setting that many users deemed unnecessary. There are a number of factors that you should investigate when choosing the best slide-in electric range for your home. These factors include expected use, capacity of the range, the overall size, power usage, maintenance and cleaning, safety and also the price. Natural gas is one of the less viable options unless you are adamant that you want that style of range. Electric hookups are the most common and one of the most affordable. They contain convection ovens that allow for even cooking and reaching boiling temperatures faster than that of a gas range. They also maintain a relatively steady number of options to accommodate for the fuel type that utilizes electricity and operate just as well as other types of ranges. There are also induction ranges, which differ from the others because they are far more expensive. They are utilized because they save time and energy by using magnetism to heat your cookware. This type of range is one of the more cost efficient and eco-friendly types of ranges but can be very costly on the initial purchase. While this guide details an Electric range, it is important to understand what else is available and how this one differs. Some ranges will have a natural gas hookup, which can be quite expensive, particularly in this day and age where prices are rising and everyone is feeling the hurt in their back pocket. First and foremost you should determine what your expected use will be for the Slide-In Electric Range. You should consider whether or not it will be utilized enough to warrant a purchase, as the cost of buying and installing one can be a bit expensive and even more so if you do not expect to make up for that cost with more cooking done in the home as opposed to other methods. Analysis of the features offered in the electric range should give you an idea of what types of foods you can cook as well as how you will cook, therefore providing you an insight into how viable it is to purchase that model. If you can’t see yourself using the oven that much on a range which has a strong and diverse convection oven as its main feature, perhaps it is not the best choice. Now that you are certain that your slide-in electric range will be put to good use, the capacity of the range should be looked into. There is no reason to buy a smaller capacity range if you intended to cook large roast meals or multiple items at the same time. Ask yourself the following questions: How many people live in this household? How many people will typically be fed? How many will want food cooked in the range on a regular basis? All are viable to ask yourself to get an idea of what kind of space will be required, as you will want to accommodate for this and save time and money when cooking. Roughly speaking, a cubic foot is an acceptable capacity space per person to allot for cooking meals in the electric range. A family of four or more would generally require at least 4 cubic feet of cooking space for their meals. 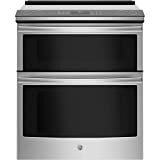 Larger ovens usually featured on electric ranges hold anywhere up to 5 cubic feet, making them a great option for large feasts, particularly on festive holidays or for any type of get together. 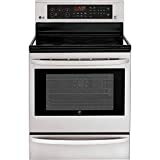 Taking into account the capacity of the cooking range, when selecting the best slide-in electric range for your home, the overall size of the equipment is also an important factor. First you will have to determine where exactly the range will slide in and if there is enough space for you to get it fitted and installed with less hassle than you would any other piece of kitchen equipment. Additionally, you want to ensure that when the electric range is installed, it can be accessed and used easily and without hassle. Does the oven door open all the way without hitting anything? Can you easily access food in the oven without hitting anything or potentially burning yourself? A generous amount of space is needed so that you can move around it and access it freely. Different sizes obviously result in different power usage. If you’re in a location that has higher electricity prices, extensive use of an electric range can become quite costly and you may want to purchase a slide-in range that is not only cooking efficient but also cost efficient. Most household appliances should have an energy efficiency rating on them to give you an idea of their energy consumption and energy saving abilities. For the most part you should attempt to avoid those that have very little indication of energy consumption or saving, as they may actually use up a lot of electricity and simply not wish to tell you. Simply put, it is difficult to set a definite amount on which is the best rating or best standard to set on energy consumption. The factors associate revolves around the way you will use the range and where you live. Whilst larger household appliances such as a slide-in electric range usually do not require too much maintenance, there may be instances where it is required and you will want to avoid simply replacing it. Purchasing a range that has less specialized parts and more generic features will not necessarily impact on the quality of cooking. It can however make it easier to fix should that arise. One of the better ways to learn about the parts involved in creation would be to contact the manufacturer and citing the exact make and model. Sometimes the manufacturer will be able to provide details on replacement parts. Some users often forget about cleaning as part of the maintenance of an appliance; something that is just as important as part replacement. Use of appliances, especially ovens can become taxing on the device. When food is involved, the object will get dirty and require cleaning to ensure that it can operate effectively. When preparing for cleaning an electric range, smaller ones are generally easier because there is less area to attend to. Most slide-in electric ranges do not maintain too many features that require comprehensive cleaning, however it is very helpful to keep the range in good condition and clean it extensively at least once every year. Safety is the number one factor with all items these days, and it is never viable to choose any other feature over that of safety. Generally speaking, electric ranges do not pose much of a safety hazard. On a similar level to a gas range, the safety of these appliances is kept quite high. In comparison, the gas range requires more caution due to the flammable and toxic nature of the gas that it operates on. A carbon monoxide detector is recommended for a gas range, however this is not an issue with an electric range. 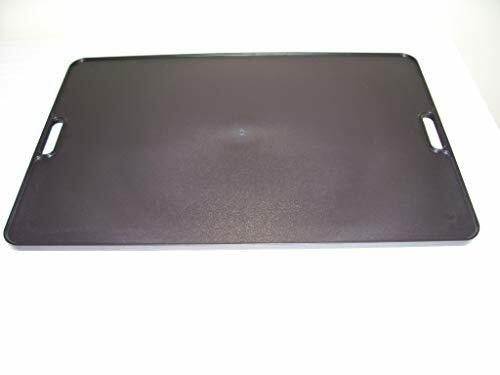 Another thing to consider is that some other ranges use induction cooking on their stove tops, which can provide an even greater safety experience, as they allow for safe touching of the stove top without burning your hand, whilst heating food. It is important to consult the device manual and manufacturer when identifying whether or not a certain range has this capability. 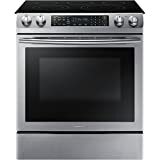 For the most part, you will not be able to find an electric range that is anywhere in the vicinity of a few hundred dollars unless you’re specifically looking at old and used ranges. Despite that, the best slide-in electric range will not always be the most expensive. The price is mainly an indicator of the type of value and features you will be receiving in your purchase of a slide-in range. It’s difficult to determine the best price, as appliances of this size and nature will differ from model to model. When trying to find the best deal, you should consider which features you want and cross check them against other models with the same features. After you do that, you should be able to calculate an average price and use this for future searching, particularly if you discover more features you wish. Also check our article on the "What are the best Slide-in Electric Ranges? ", for more electric range choices. Electric ranges are the most-bought type of range by homeowners in the United States because not all areas are covered by a gas line. While there are always provisions for using gas tanks or propane tanks, many people, who live very busy lives can’t be bothered by the hassles connected to gas tanks, not to mention the many risks of using it. Electric ranges are also very easy to use because all you have to do is plug it in. The only con may be the amount of electricity bills you have to pay, especially if you live in an area where the charges are soaring sky high. Despite this, the demand is still high, and many manufacturers are doing whatever they can to produce cost-efficient models. These electric range models have evolved through the years to cater to the different needs of the consumers. One of these notable needs spawned the creation of electric ranges with double ovens. The reason behind it is the fact that users can bake small dishes in one small oven rather than heating up an entire big oven that won’t be maximized. This way, energy is saved. 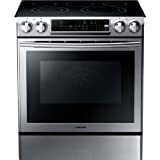 If you are on the quest on the perfect electric range with double ovens, we have listed models here worth checking out. This electric range has five smooth top cooking burners in varying sizes. Pots and pans of different shapes can easily rest atop the burners. Each has varying BTUs, depending on the sizes. Each cooktop size can also be adjusted to cater to all cooking ware sizes. Two are big ones while three are smaller stoves. 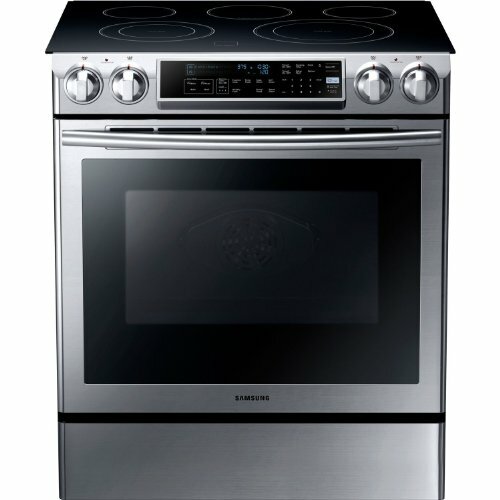 It comes with two ovens that are big enough to easily fit a 28-pound turkey or multiple dishes each. This way you can finish all the cooking that you need to do without having to wait and waste time. Because each oven functions on its own, you can bake dishes in different temperatures each, great if you are looking for cooking flexibility. It has pre-set options that make cooking easier and faster. You don’t have to guess the time and temperature for some dishes that you can bake such as chicken nuggets, pizza, pasta, etc., which is good if you aren’t a self-proclaimed chef and have no clue at baking. Only con that users experienced is the grill that comes with the oven. It is not tightly secured to the oven because of the flawed rack support mechanism. This causes the rack to fall down the bottom of the oven whenever heavy food is placed to bake. 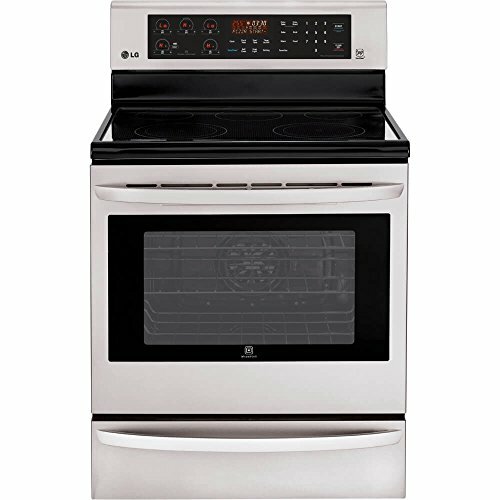 This 30-inch freestanding electric range is perfect for kitchens with minimal space as it is just the right size. It contains five heating elements that suit all sizes of pots and pans because each element can be adjusted accordingly. The BTUs for each element vary, depending on the size of the element. It comes in two large elements and three smaller ones. The double ovens are big enough to fit most of the dishes you want to cook, even a whole turkey or chicken, and big slabs of ribs. The upper oven has a total capacity of 2.3 cubit foot while the lower oven has 4.4 cubic foot, totaling to a large capacity of 6.7 cubic foot. 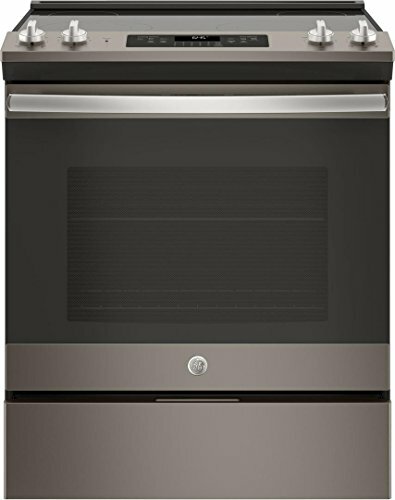 LG advertises the top oven to be used for baking pizza and other smaller capacity dishes. Both ovens are pretty fast to pre-heat so waiting time is lessened. It uses an infrared grilling system to produce maximum heat to cook your dishes. It also features EasyClean Self-Cleaning so you don’t have to take out everything from the oven to scrub and clean. All you need to do is spray the insides with water and turn the cleaning program. There are two options: Easy Clean and Self Clean, which use more heat for tougher stains. 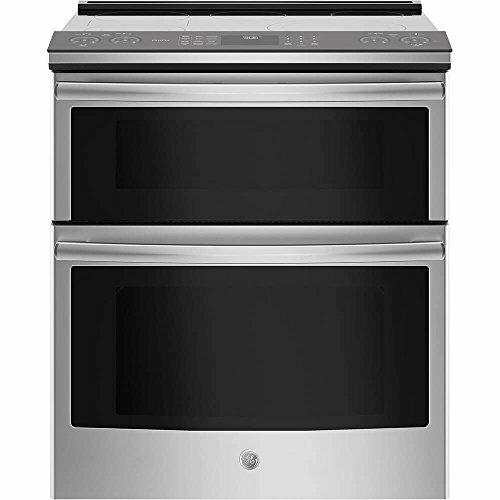 This electric oven is the slide-in type that you can install in-between cabinetry or counters. Take note that this is because a slide-in oven, the sides are not furnished as it is meant to be covered. It looks great as a slide-in range because the top part are widened to make sure it rests on each side, giving it a built-in look. It comes with five heating elements in varying sizes, the smallest being 6 inches and the largest at 12 inches. Pots and pans easily fit onto the heating element as each are flexible. The double ovens are very easy to preheat and have a total cooking space of 6.6 cubic foot. Both ovens also have a self-cleaning option so you can cook as much as you like without worrying about the mess you make. The only con about this product is the price. Although this is a really great convection oven made by a reputable company, the price, which breaks the 2,000-dollar mark, seems too much for an electric slide-in range. 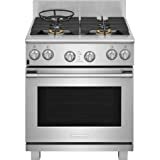 There are same quality, stainless steel electric ranges with the same number of heating elements and ranges that are around a thousand bucks and are also made by good companies. If you are willing to shed this much, then this will be definitely a great range with double ovens. Before purchasing electric ranges, consider your needs, as you may not really need something as big as the ones listed here. Although four to five heating elements are almost the staple in most ranges, some people purchase it just because everyone has it, not because they need it. If you have a big family, cook almost all the time, and throws parties at home every now and then, consider getting any of the electric ranges listed here because you would really get what you pay for. Don't miss out our article on the "What are the best Slide-in Electric Ranges? ", for more electric range choices. Ranges are appliances that combine a cooktop and an oven. Because of its functionality, most ranges come in prices over a thousand dollars. It is unfriendly in the pocket and is therefore daunting to go shopping because most of us will be afraid to spend hard earned cash for something we aren’t sure about. 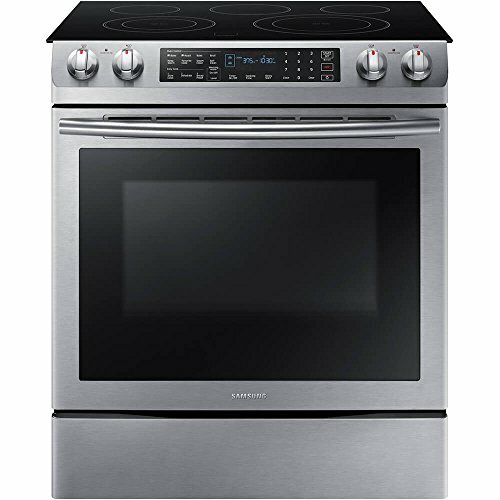 There are tons of options for electric ranges; gone are the days when you have to buy separate stove and oven. A lot of manufacturers build and support ranges now, which made it more reachable for the consumers. Because of the variety of choices, many customers found the search overwhelming. In this article, you will read about some slide-in electric range reviews as well as the factors on how to select the best slide-in range. You will want to get the perfect one at first buy as installation, testing, repair, and returns produces a lot of hassle. Make sure you find something that you really want and willing to stick with for years. Below you will read short reviews on the best-rated slide-in ranges on Amazon. By reading through the reviews, you’ll get an idea of what to include or exclude in your to-buy checklist. How to choose the best slide-in electric range? This slide-in smooth cooktop electric range features five burners that vary in sizes, beginning from 6 inches to 12 inches. It can cater to a variety of pots and pan sizes with ease. At the bottom you will find two self-cleaning convection oven that has a total cooking capacity of 6.6 cubic foot, enough for several platters of casseroles and pans of cookies. The only con for this product is the price; it is very expensive for an electronic range. 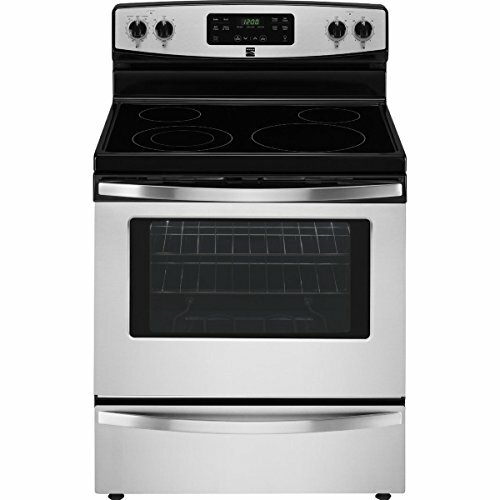 This electric range features five burners and one spacious oven. It has a 5.8 cubic foot cooking capacity that enables you to cook multiple dishes at once. The controls are illuminated and has different cooking options. The oven comes with three oven racks to separate casseroles and pans and a storage drawer where you can put newly cooked food to preserve its temperature until dinner is ready. One of its best features may be the true convection cooking that uses a dual fan system for faster and more even cooking. This range features five electric burners and one large oven. 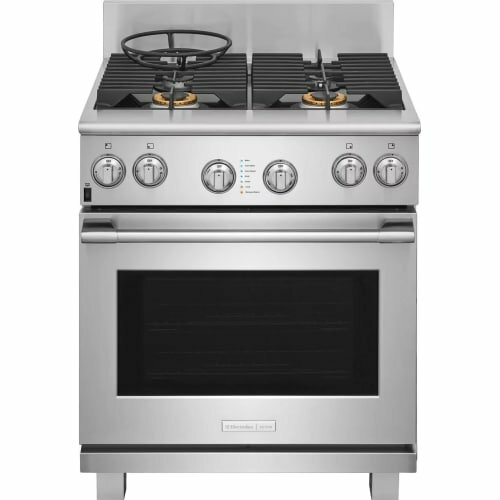 It comes with pro-select controls, heavy duty grates for baking, and professional style knobs that are very durable. One of the best features of this range is the PowerPlus Preheat that does the job in only a matter of minutes, lessening waiting time. It also has one-touch options for cooking pizza, chicken, and other dishes. Children are also safe because of its easy to control lockout system. There are a few factors that you should consider before buying a slide-in electric range. Reading through them will make your decision-making much faster and concrete. Remember, don’t make an impulse buy. Planning is greatly required for appliances such as this. There are two types of electric range: The coil cooktop and the smooth top. The first one uses metal heat conductors that are spiraled. This is where the heat is focused and where you can rest your pan. It pretty much works like a gas burner, except that the coil looks so much different and it doesn’t produce fire. The heat of the coil is fixed and provides an even cooking heat, although some users say that the distribution is sometimes not that great. Electric coils have drip bowls or pans underneath to catch food and spills. It is available in a lot of colors and finishes and is easy to maintain, although a hassle to clean, as you have to take out the coil and the pan. The best thing about coil is the fact that it is cheaper to repair and replace. You can also do it on your own, without spending too much on a professional. Smooth top on the other hand is pricey to repair and you have to hire a professional to do it. However, it looks really nice because of the smooth glass ceramic. It is also easier to clean, as all you have to do is wipe the spills on the cooktop. Do you plan on cooking a lot? Do you usually need more than four burners when you cook? Do you love to have parties at home? If your answer is yes to all these questions, you undoubtedly need a big range that has four or more burners. This is so you can finish all the cooking that you have to do in less time. You’ll have more time for preparing the house and relaxing. With regards to the oven, think about the dishes that you will bake. If you’re planning to bake huge whole turkey and big slabs of meat, you may need a bigger oven that can fit these. If you are going for casseroles, you can choose to have two smaller built-in ovens that can bake different dishes for time efficiency. Remember, the bigger the oven, the more power and electricity it will consume. Make it a habit to check what other people are saying about their appliance. Customers tend to leave very honest reviews and you will get tips on which brands to avoid and how to sort things out in case you encounter problems. Reviews are generally helpful and will make it easier for you to decide whether a product suits you or not. Get the best out of your hard-earned cash by looking for the slide-in electric range that works for your needs, wants, and budget. You don’t really have to splurge on a range as long as the one you got is good quality with good manufacturer support that will last you years of service.